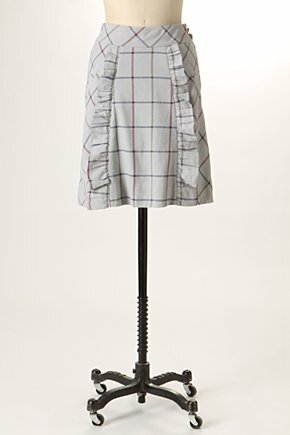 I just love the Sidestep Skirt from Anthropologie, but it was expensive so I waited for it to go on sale. Now they're all sold out in my size. (EDITOR'S NOTE: it's completely sold out now) I was wondering if you had any suggestions for a knee-length (not too short, because I'm really tall) skirt, preferably with some navy/pale blue/or gray in it since I have some fabulous navy and gray shoes I want to show off! Also, there is a giveaway coming later this week, so make sure to come back! wow, i need to hit Joanns and get some plaid fabric. with the right pattern, that skirt would be soo easy to make!! The first one is super cute! I've been looking for a good pencil skirt, maybe I'll check out Ann Taylor Loft, thanks! I think your options would be more versatile, and therefore even more cost-effective. Good job, as always! Thanks for the suggestions! I'm loving the ruched one!